And fully know your worth. Jesus suffered and died outside the city gates to make his people holy by means of his own blood (Hebrews 13:12; NLT). In his kindness God called you to share in his eternal glory by means of Christ Jesus (1 Peter 5:10; NLT). Jesus came and told his disciples, “I have been given all authority in heaven and on earth” (Matthew 28:18; NLT). Serve the Lord with gladness! (Psalm 100:2; RSV). There is only one thing worth being concerned about. Mary has discovered it, and it will not be taken away from her (Luke 10:42; NLT). On the day of my mastectomy, as I waited on a trolley outside the anaesthetic room, I was suddenly overwhelmed by a profound terror of suffering and death, just as Jesus was in the Garden of Gethsemane. I felt completely helpless, despairing and alone, shaking uncontrollably with cold and fear. Then my surgeon entered the room in blue scrubs. She must have seen at once how distressed I was, because she came straight over to me, putting her arms around me and bending down to lay her head gently on my chest. She seemed like an angel of comfort and strength. I managed to whisper, through chattering teeth, “I’m so frightened!” She didn’t even speak, just held me as I sobbed helplessly. After a time, realising how cold I was, she moved to stand behind me, rubbing my arms to warm me, until I was pushed into an ante-room and quickly, skilfully anaesthetised. That evening, after the surgery, I wept again. 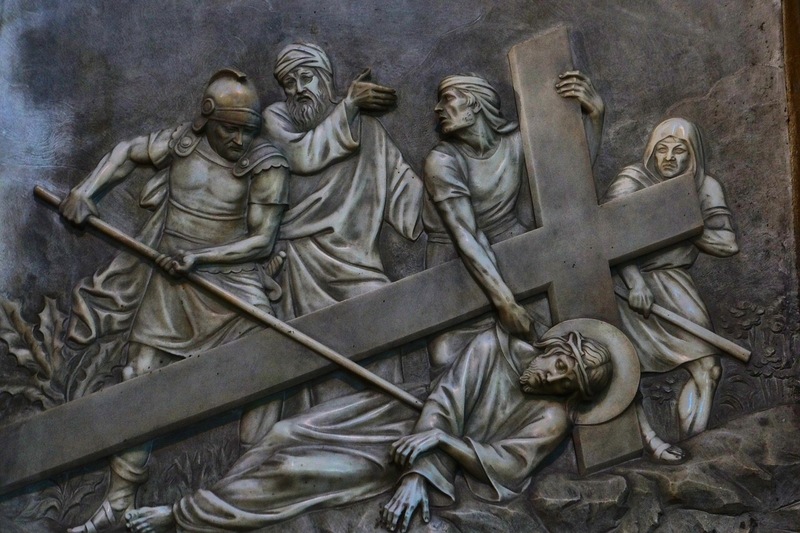 I felt as if I had experienced something of what Christ suffered in Gethsemane, just as those gazing at a representation of Jesus on the cross occasionally undergo the pain and powerlessness of his crucifixion. Next day, however, I realised that rather than we ordinary mortals sometimes sharing what Jesus experienced, it was, in fact, he who fully shared our primeval, human terror in the face of imminent suffering and death. Of course, there are major differences between my experience and his. I was facing my profound fear of anaesthesia and surgery solely for my own benefit. Jesus, on the other hand, was facing betrayal, torture and death so our sins could be forgiven. I hope I will never cease to thank him for what he faced and endured for our sake. My heart pounds in my chest. The terror of death assaults me. Fear and trembling overwhelm me, and I can’t stop shaking (Psalm 55:4-5; NLT). They went to the olive grove called Gethsemane, and Jesus said, “Sit here while I go and pray.” He took Peter, James and John with him, and he became deeply troubled and distressed. He told them, “My soul is crushed with grief to the point of death. Stay here and keep watch with me.” He went on a little further and fell to the ground. He prayed that, if it were possible, the awful hour awaiting him might pass him by (Mark 14:32-5; NLT). Then an angel from heaven appeared and strengthened him. He prayed more fervently, and he was in such agony of spirit that his sweat fell to the ground like great drops of blood (Luke 22:43-4; NLT). Angels came and took care of Jesus (Matthew 4:11; NLT). In him we have redemption through his blood, the forgiveness of sins, in accordance with the riches of God’s grace (Ephesians 1:7; NIV). God proves his love for us in that while we were still sinners Christ died for us (Romans 5:8, NRSV). As he pleads in Gethsemane. As he hangs on Golgotha’s tree. As he yearns for death’s release. As he finds, at last, God’s peace. He hears us (1 John 5:14; NIV). They went to the olive grove called Gethsemane, and Jesus said, “Sit here while I go and pray” (Mark 14:32; NLT). If it is possible, let this cup of suffering be taken away from me.Yet I want your will to be done, not mine (Matthew 26:39; NLT). They brought Jesus to a place called Golgotha (which means Place of the Skull) (Mark 15:22; NLT). Remain in me, and I will remain in you (John 15:4; NLT). The Lord your God goes with you; he will never leave you nor forsake you (Deuteronomy 31:6; NIV). I will be a sanctuary to you during your time in exile (Ezekiel 11:16; NLT). Walk in the way of love (Ephesians 5:2; NIV). My soul is crushed with grief to the point of death (Matthew 26:38; NLT). Then we will be with the Lord forever (1 Thessalonians 4:17; NLT). Father, if you are willing, please take this cup off suffering away from me. Yet I want your will to be done, not mine (Luke 22:42; NLT). I trust in God, so why should I be afraid? (Psalm 56:4; NLT). And he embraced your will.